Sunday 8th March was International Women’s Day. I celebrated by attending a book launch. 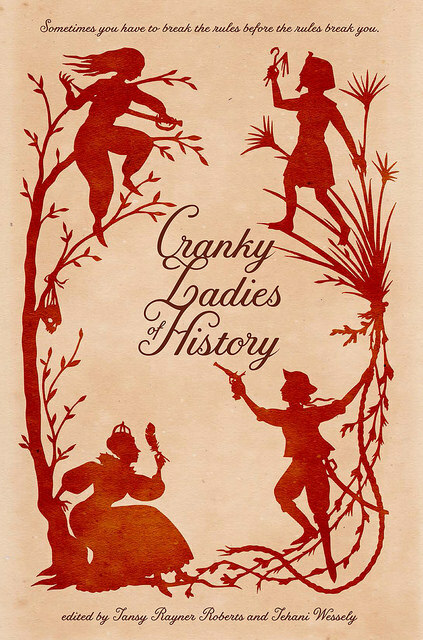 Cranky Ladies of History is the latest anthology from Fablecroft Publishing and is edited by Tansy Rayner Roberts and Tehani Wessely. The book contains 22 pieces of fiction, each inspired by a different historical cranky lady. 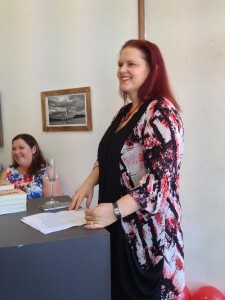 The launch took place at The Front Gallery and Cafe on a hot and sunny afternoon. There was an enthusiastic turnout from a spectrum of communities including speculative fiction writers, history enthusiasts and feminists of all ages. They ensured that Fablecroft’s book stall did a roaring trade. Editor Tehani Wessely with guest Karen Middleton in the background. Tehani Wessely, editor and owner of Fablecroft, kicked proceedings off by thanking those who had assisted in the creation of Cranky Ladies. She then turned the show over to guest speaker Karen Middleton but not before sharing Karen’s impressive bio with the audience. Despite her long list of accomplishments, Karen was a wonderfully down-to-earth speaker, joking that she identified more with ‘cranky’ than with ‘lady’. 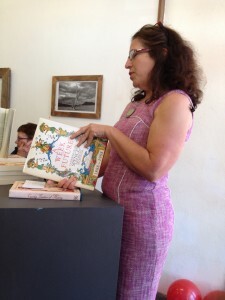 She was the perfect person to launch the book and she did so with great eloquence. Tansy Rayner Roberts took the stage next, speaking about the genesis of Cranky Ladies. A copy of her speech is up on John Scalzi’s blog and details just how much support the book received from the very beginning. Readings at book launches are traditional. However, cranky ladies are not generally keepers of tradition, so instead we heard a little bit from a few of the authors about their chosen cranky lady. Kaaron Warren spoke about Catherine Helen Spence, an Australian suffragist who, as well as campaigning to better the lives of women and orphans, was an author. Before Edward Bellamy published Looking Backwards and H.G. Wells wrote The Time Machine, she wrote A Week in the Future in which she gives readers a tour of the utopia she imagined might exist in 1988, one hundred years in the future. Kaaron was inspired to do the same for her Cranky Ladies story. Barbara Robson shared the rags-to-riches story of Theodora, a prostitute who went on to become the wife of Emperor Justinian I. Most information on Theodora’s life comes from a scribe by the name of Procopius who utterly reviled her. Barbara contemplated the parallels here with former Prime Minister Julia Gillard. Lastly, Thoraiya Dyer gave a rousing account of Ranavalona I, Queen of Madagascar. Ranavalona’s success at eradicating Christian missionaries and fending off white colonialists earned her the title of Ranavalona the Cruel. Unfortunately, her efforts to preserve her culture and the natural resources of her home didn’t last much beyond her lifetime. Thoraiya suggested that perhaps it was time Madagascar saw the likes of Ranavalona return to aid locals holding mining giant Rio Tinto to ransom with spears and slingshots. The afternoon wrapped up with a raffle. Joanne Anderton came away with a gorgeous canvas print of Kathleen Jennings’ cover art and Val Toh won a hardcover copy of the book–hardcover copies being otherwise only available to those who backed the Kickstarter campaign. If you’re looking for your own copy of the anthology, you can buy it directly from FableCroft Publishing or check their list of e-book suppliers. Tehani also has her launch report posted and you can find some gorgeous photos of the afternoon on Cat Sparx’s Flickr account.